The HAI Home Theater Extender 2 (HTX2) lets you extend your home control to the existing audio/video equipment in your home theater. Users can control their home theater equipment from an iPhone, iPad, or iPod Touch using the HAI Snap-Link Mobile for iPhone app, or via an HAI OmniTouch 5.7e Touchscreen. The HTX 2 sends IR commands to your A/V equipment. Interfaces are customizable using HAI Automation Studio (for HAI Touchscreens) and Mobile Designer (for iPhone/iPad), which allows you to set up pages to control each A/V device in your household. Mobile Designer is included with the purchase of an HTX2. Send multiple commands to your A/V equipment with one button press on the Touchscreen. Turn on your Blu-Ray player, the amplifier, the TV, and have it play the Blu-Ray - all with one button press. Contact closures can even control window coverings, lights, as well as home theater components. An HAI HTX 2 can be controlled from multiple interfaces and is configured using HAI Automation Studio software. Users can control their AV equipment using n in-wall Touchscreen require an OmniTouch Touchscreen or Snap-Link Mobile for iPhone/iPad. 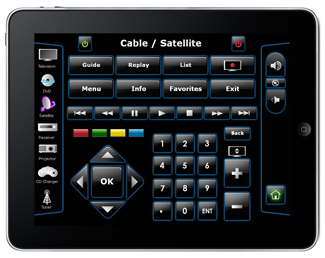 The Touchscreen/iPhone sends commands to the HTX 2, which controls A/V equipment using its serial and IR ports, as well as its SPDT relays and TCP/IP. There is no limit to the number of HAI HTX 2's that you may use in an installation. Automate any Room without an HAI controller! With the HAI HTX 2, a customizable OmniTouch Touchscreen, and Automation Studio you may automate any room, whether it is a home theater, corporate boardroom, or a school's classrooms. You can set up a single button to close the curtains/shades, lower a screen, and turn on the appropriate A/V equipment. When you add an HAI home control system to this set up, you can add control of the room's lighting, temperatures, and more to the same button on the Touchscreen, as well as add remote access from outside the home. 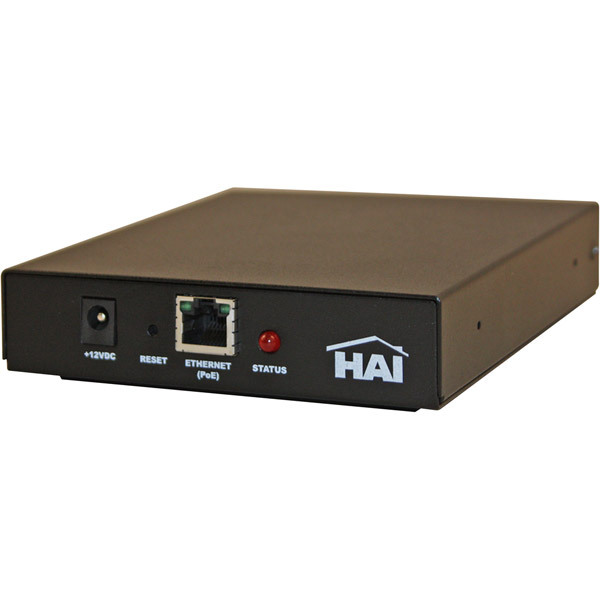 The HAI HTX 2 may be powered from the supplied 12VDC power supply that comes with the unit or via Power over Ethernet (PoE). The HAI HTX 2 has a built-in IR library with the IR codes for over 300,000 devices and has the ability to learn new IR codes. There is one bi-directional RS232 serial port available. The available baud rates on it are 300 - 115200. The two I/O ports on the HAI HTX 2 are used for power sensing. For example, since some devices do not have a discrete Power ON/OFF IR commands, you do not want to send this command to turn on the equipment if it is already on (this would turn the equipment off). There are two Relay ports that may be used to control any device that requires a contact closure, like a motorized screen or blinds. It may also be used to source and switch 12VDC for power amplifier triggers. These Relays ports are rated at 2A @ 30 VDC. There are four IR Emitters. They use standard 3.5mm IR blaster type connectors. Note that the HAI HTX 2 comes with 4 Flashers (emitters) that have six foot cords. There is an IR Leaner port that allows you to add custom learned IR keys to the HAI HTX 2. It uses an IR #5 LED.